Target, Wal-Mart, and Costco all look like Super Stocks. 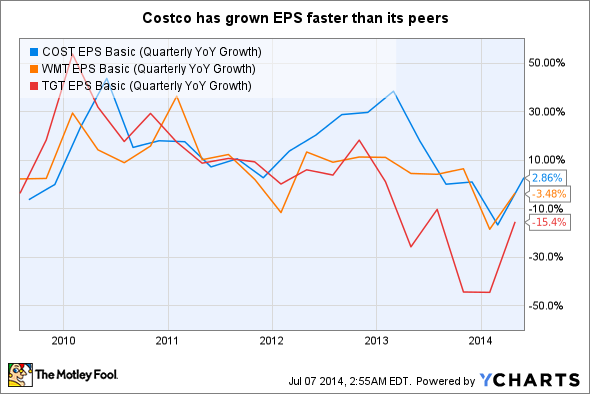 Here's why Ken Fisher would choose Costco first. Legendary Investor, Ken Fisher first introduced the world to the price-to-sales ratio in his best selling book Super Stocks. While you probably have heard of Fisher, what you may not know, is how tremendously successful this approach has been for him. According to Fisher Investments, since its inception, the stocks chosen following the Kenneth Fisher model have outperformed the market four-fold. Right now, there are three stocks that look cheap by the price-to-sales ratio metric: Target (NYSE:TGT), Wal-Mart Stores (NYSE:WMT), and Costco Wholesale (NASDAQ:COST). Of the group, Costco is the one "cheap" stock of this group Ken Fisher would love most. Here's why. Since the inception of valuing stocks, the price-to-earnings ratio has been the preferred tool for valuing stocks. Ken Fisher saw that the P/E ratio sometimes missed really cheap stocks for a couple of reasons. As we've seen in recent years, earnings can be overstated making some stocks appear cheaper than they really are; sales and cash flow can be harder to "fudge." Separately, Fisher noticed that revenues tend to be much more consistent, year over year, than earnings which can vary depending on the present stage of a companies growth cycle. You arrive at the price to sales ratio by taking a given firms market cap (or value) and then dividing it by total revenues over the past twelve months. Cheap stocks by this model have a price-to-sales ratio under 1.5, and the best have P/S ratios under 0.75. As you can see in the chart below, all three of these stocks look stunningly cheap by the P/S ratio, with Costco seemingly the cheapest. 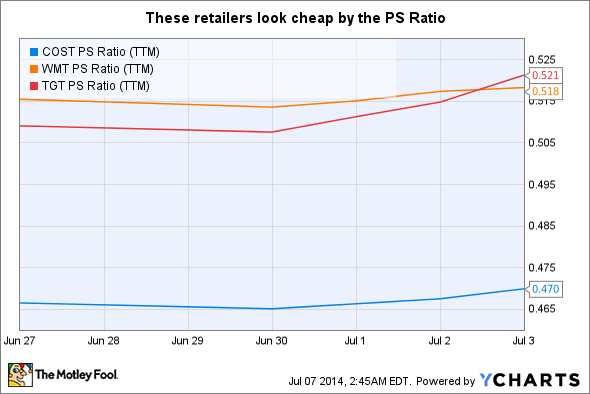 With cheap P/S valuations, all three of these retailers might be good investments today. Chalk it up to brick-n-mortar retailers being "out of vogue," but all three look remarkably cheap. What makes Costco unique is that it doesn't look nearly as cheap on a price-to-earnings basis; it has the highest P/E ratio (24), compared to Wal-Mart's P/E of just 14. Since it has the lowest P/S ratio of the group, and one of the lowest among all large cap stocks, it clearly is the kind of Super Stock that Ken Fisher thought P/E ratio's missed. There could be a reason for this. Costco's business is driven by membership revenues and it makes a very small margin on its merchandise, naturally its sales may be more impressive. Fisher didn't pick all stocks that fit the metric however, because businesses that are in decline will often appear cheap on a P/S (or P/E) basis for a while. That's what makes Costco a stock that Ken Fisher would love. 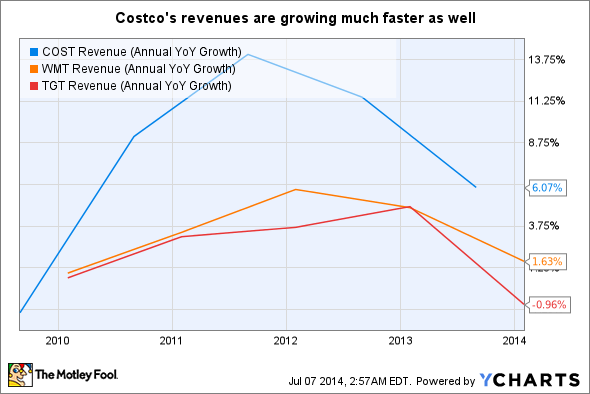 While all three of these stocks appear cheap at the moment, the chart below shows that Costco is growing faster. If you look at Ken Fisher's track record, it's hard to argue that the P/S ratio is a great starting point for stock picking. It may also be more relevant right now than ever, because so many companies seem to be growing EPS through cost cutting (even as sales stay flat). That said, like all metrics, Ken Fisher's "screener" is just a starting point. All three of these stocks look cheap by the metric, but when you look closely, Costco appears to be the cheapest.